An original recording of this discourse is available at churchhistorianspress.org (recording courtesy BYU Women’s Conference). Born to Latter-day Saint parents in Lethbridge, Alberta, Canada, Bennion is a classically trained pianist who studied at the Banff School of Fine Arts and has degrees from the Royal Schools of Music in London, England, and the Western Board of Music. She earned a bachelor’s degree in French from Brigham Young University (BYU) and a master’s degree in English from Ohio State University, where her husband, Robert C. Bennion, earned a doctorate in clinical psychology at the same time.3 Together they raised three children. Bennion taught reading, writing, and logic courses part time at Ohio State between 1957 and 1961. 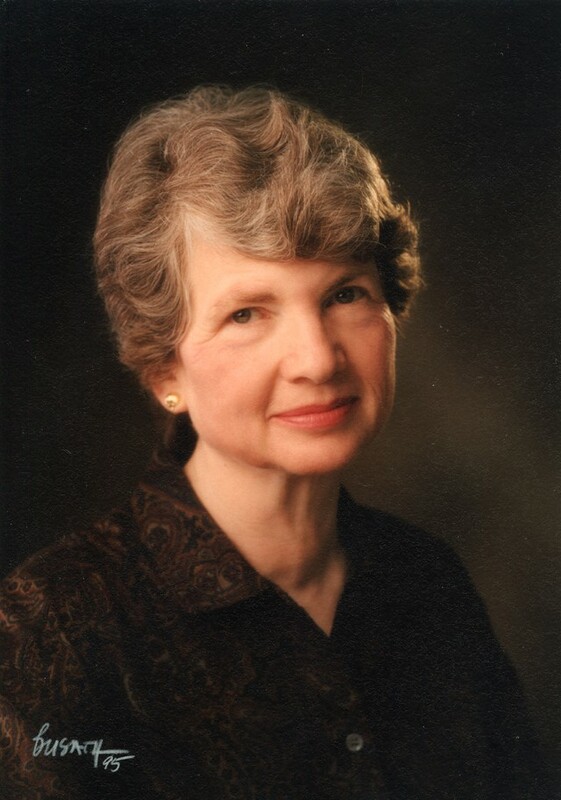 Between 1961 and 1997, she taught courses in English, piano, Book of Mormon, and history of civilization at BYU.4 Throughout her career and church service, she expressed her devotion to logic, words, and ideas. It is not my purpose here to give careful definition of the term suffering or to distinguish between various kinds of suffering. For purposes of this discussion, suffering is anything that hurts badly, in any way. Nor is it my purpose to answer all questions about suffering, or even to suggest that we all have the same questions. We have our own quests, and the search for peace must be our own. My intent is to discuss the reservoir to which many of us go for understanding and comfort in time of anguish. My friend Sheila Brown came out of brain surgery with one side of her body paralyzed and with her speech and sight badly impaired. As we worked one day at stretching and relaxing her muscles, Sheila asked me what I was going to talk about at the BYU Women’s Conference. “I think it’s the same thing,” I replied. We are accustomed to talking of fragments of theology—a topic here, an assumption or tradition there, often out of context with the whole. We are a people accustomed also to fragments of scripture out of context—a phrase here, a verse there, words that say something appropriate to the matter at hand, and ring with clarity and conviction. We have to do it; we haven’t time or ability to say everything at once. Sometimes, however, the clarity becomes blurred and the conviction open to question when a person puts some fragments with others. For example, what do you make of the following? One function of theology is to provide a comprehensive framework that gives meaning to the fragments and the seeming contradictions or paradoxes which they suggest. Theology provides a framework that binds diversity and complexity into a more simple net with which we can make some sense even of things we don’t fully understand. It’s been a week of varied emotions. My friend, Jean Kerr, died the morning after I arrived.13 It seems I’m destined to spend part of my beach time in Hawaii contemplating the death of a good friend. The beach, at least for me, like the mountains, is a good place for such contemplation. Again, my thoughts have been drawn to the “why” of it all. For those of us in the church, there are at least a few answers to that question. But as I look at my friend and wonder what her purpose in life was—it seems that suffering has been the only purpose. … Suffering without a sense of purpose seems bitter indeed. Her mother said her husband prayed all night for her to die. Does one who doesn’t believe pray to anyone or anything? Or is it merely another way of saying—he yearned for or hoped that she would die? Do you think such a prayer will be heard when all those given for her healing have not been? One function of any religion is to explain such a world as this, to provide a theology that makes sense of love and joy and miracles but also of suffering and struggle and lack of miracles. Good theology makes sense of what is possible but also of what is presently real and probable. In this twentieth century, it is not enough that a theology of suffering explain my experience; it must also explain the child lying in a gutter in India, the woman crawling across the Ethiopian desert to find a weed to eat, and the fighting and misery of many humans because of pride, greed, or fear in a powerful few.16 Satisfying theology must explain the child sexually abused or scarred for life, or the astronaut who is blown up and leaves a family motherless or fatherless.17 Good theology of suffering explains all human suffering, not just the suffering of those who feel they know God’s word and are his chosen people. It is not enough that theology be either rational or faith promoting. It must be both. It is not enough that satisfying theology be mastered by a few expert scholars, teachers, and leaders. It must be comfortably carried by ordinary people. It is not enough that theology help me to understand God. It must also help me to understand myself and my world. Theology does not prevent all hurt and anguish. No knowledge of theology can remove all pain, weakness, or nausea from all terminal cancer. Nor can it fill an empty stomach. What sound theology can do is to help those who believe it to make some sense of the suffering, of themselves, and of God, such sense that they can proceed with a measure of hope, courage, compassion, and understanding of themselves even in anguish. We do not use identical principles or patterns to bind together fragments of scripture and life. In this twentieth century, with the history of the world before us, each of us has taken ideas and patterns from various sources to form our personal theologies of suffering. The complexity and power of those sources are evident in the story of Jephthah. According to the book of Judges, chapter 11, Jephthah was asked to lead Israel against invading Ammonites. And Jephthah said unto the elders of Gilead, If … the Lord deliver them before me, shall I be your head? And he smote them … with a very great slaughter. Thus the children of Ammon were subdued before the children of Israel. And she said unto her father; Let this thing be done for me: let me alone two months, that I may go up and down upon the mountains, and bewail my virginity, I and my fellows. A human being’s function is to obey the law. If God had wanted the obedient daughter saved, he could have prevented her from dancing out at so inopportune a moment. We do not all read the same things into Jephthah’s story, or into sacrifice.21 Even in so short a story, the context for suffering is complex and today provokes questions such as these: Who is really responsible for the suffering in this story? Jephthah? God? The religious leaders who taught the theology that contributed to the making and keeping of the vow? Persons who developed a social system in which a daughter is her father’s property? What of Jephthah’s wife, who isn’t even mentioned? What about Jephthah’s father and harlot mother, and the half-brothers who threw Jephthah out of the house earlier in his life and perhaps contributed to his great desire for the power that victory would bring?22 What about Jacob, who set a precedent by bargaining with God?23 Or Moses, who, without regard to circumstances, seemed to teach that keeping a vow was more important than “selfish” compassion? This list does not, of course, exhaust the questions, which go beyond reasons for Jephthah’s vow; for example, is obedience always a virtue? Is the major difference between God and Satan just a matter of who’s in charge, demanding obedience? What do you think about Jephthah, his vow, and his God? Your answer will depend in part upon your own version of theology. Does it really matter what we think? Can’t we just be kind and patient, without worrying about various points of theology? Many who believe God is causing the suffering will not, or feel they cannot, ask him for help or comfort at the very time they need it most. If, like Job, we find that the comforts we’ve offered others aren’t sufficient for our own experience, then the suffering itself, however great, is not the only problem. The problem is also that the universe and our ability to make sense of it have fallen apart, and we are without hope or trust in ourselves or in God. Theology can become an even heavier problem than the anguish of suffering itself. If we believe suffering shouldn’t exist, but it does; or suffering is God’s way of testing and teaching, but what can a wailing infant be proving or learning; or prayer should cure the problem, but it hasn’t—then it is not only the suffering that troubles us but also the great cracks in a universe that should make sense but doesn’t. I have seen the pain of persons in this place, the pain of persons fumbling with their long-held assumptions when the ancient questions rise afresh, though they had thought them already answered: Why is this happening? Can I stand it? What can I do? What am I? Is God real, or powerful, or good? What is life for? What does he want us to do with it? Important to one’s struggles with such questions are the implications of elements at the core of one’s theology—for example, Latter-day Saint belief that we can become more like God, our Eternal Father, not just obey him or imitate him or follow his Son, though these things are part of the process, but become gods ourselves with his help. And then there was silence, for a moment. In wanting to get to the celestial kingdom, these students had more awareness of traditional struggle-free utopias than of our own God and our own world. The celestial kingdom was a place to get away from suffering, not a place to understand it and address it in ways consistent with joy and love and agency. It is not only professed points of doctrine such as potential godhood or the celestial kingdom that matter but also the meaning and larger framework that a person gives to them. The larger framework gives meaning to the fragments. I haven’t heard anyone in or out of our church ask why God caused seven persons to fall in bits to the bottom of the sea when the space shuttle Challenger exploded. We are accustomed to a methodical framework for space travel, and we looked within that framework for explanations of the disaster. A commission began to examine video reruns, O-rings, materials, workmanship, memos, organization, and decision making, among other things, to identify and address problems before proceeding with the next manned space project. The process was complex, but even minor steps had been recorded, and a meticulous report was possible. We can make such a report to trace the steps in many kinds of suffering, but usually we have neither time nor ability to reduce all causes and all effects to a satisfying xeroxed page.33 Even when we can do it quite accurately, we are most likely reporting how the suffering came about, not why. Some twenty years ago, a man watched his mother die miserably of cancer and then, closing up the house, said, “I cannot pray to a God who would let my little mother suffer like that.” He did not want a step-by-step report on how cancer causes pain, or how she got the cancer. He wanted to know why cancer exists at all, why there is pain, why God doesn’t prevent it, why the innocent suffer, why a small frail human would have such undeserved hurt. What purpose could justify such anguish? What comprehensive model of existence could make sense of it? We have not the mind of God. We see through a glass darkly now and will till we meet him and ourselves face to face and “know as we are known.”34 There are times we must say, “I don’t know.” If we think we know everything, it is a sure sign we do not. But we are capable of learning much about this world and of considering what difference LDS doctrines can make to how we put together our experience, our diverse scriptures, our traditions, and well-supported but contradictory theological explanations. The better we understand what is at the core of LDS doctrine, the better we can distinguish what is not. We need not shroud ourselves helplessly in a crazy quilt stitched haphazardly from Old Testament theology, such as that of Jephthah, with a few patches of utopian thought and LDS doctrine embroidered on top. We can extend our understanding of LDS principles and use them as the core for a framework with which to make some sense of contradictory fragments. Of course it may seem simpler to stay on well-worn traditional ground, but God—and this is one of the most important things we believe about him—has invited us to go further, to make suffering worth the trouble and to meet it as well as we can. We can be in the process of learning to do that whatever our current limitations or circumstances. Though our search for understanding be long or incomplete, it can lead us to courage, peace, and an increasingly truer sense of ourselves and God. The traditional views are that we are alive because God put us here, or because Eve and Adam fell from innocence and trouble-free paradise through disobedience. These views are expressed in scripture. The Latter-day Saints believe, however, that these traditional views are fragmentary because they leave out several important things—for example, that we have existed without beginning and that we are here because we chose to come.35 We are here not just because God decided it would be a good idea and made it happen, not just because Adam and Eve fell and we automatically followed, but because we chose to come. However essential what God or Eve or Adam did to make it possible, we believe the decision to be born was our own. Our very brief accounts of life before this earth suggest that we chose as Eve chose, and we defended that choice in whatever kind of war can take place among spirits.36 Our birth is evidence of courage and faith, not helplessness, shame, and disobedience, and yet we must make sense of conflicting reports about it, seemingly contradictory fragments about it. If we are to make sense of them, we had better understand well the implications of those brief fragments we have about our existence before human life began. We don’t know if there were several possibilities of which we have no record, but I doubt there was a never-never land where we could have been happy children without responsibility forever.37 Apparently there was a point at which we had to grow up or choose not to. Our scriptures suggest that there were unavoidable decisions to be made consciously and responsibly by all inhabitants in the premortal council, as in Eden. We could not be mere observers, only thinking about the decision, only imagining what might happen if we made it, only talking about the meaning of it all. At any rate, God’s directive to Alma when he watched good women and children being burned alive in Ammonihah suggests that it was not enough to imagine what might have happened if they were burned to death, or what might have become of the persons who were doing it.38 God didn’t want to know just what could happen and neither, apparently, did they in the beginning. At any rate, we are told that there were two alternatives. Lucifer proposed a way so different from God’s that it would have destroyed this universe in which God speaks of I and thou, they and we, this universe in which Elohim and Jehovah speak of their own names and also address by name Eve, Joseph, Moses, Mary, Abraham, Helaman, Peter, and Emma.39 Lucifer would have for all of us only one name, one will, one identity: his own. It was not obedience and “success” (by his definition) he would prevent; rather it was disobedience and failure he would not allow. In his universe, no one would be hurt or afraid. He would allow only whatever experience and identity he chose for us, and if we met pleasure, pain, or success, it would be wholly because of himself, not because of ourselves. The wonder is that Lucifer’s intended universe is exactly the universe many now attribute to God, or want from him. God offered a profoundly different possibility, that with his help we meet and create reality as individuals in a universe of law and personal agency, and ultimately choose who we want to be, choosing to become more like himself if that is what we want, choosing to become gods if that is what we truly want for all eternity.40 Law in God’s universe is a matter of processes or relationships that are knowable and predictable, not whimsical or inconsistent. Such law is inherent in all matters. Agency in such a universe is not only the capacity for moral choice, but more largely, the capacity for real thought, action, and invention, with inherent consequences for oneself and others. An agent is one whose self cannot be permanently determined by other persons, or by events and circumstances. The implications of this doctrine are important to our suffering whether we live in England or Africa, with or without current understanding of God’s ways. We wanted life, however high the cost. We suffer because we were willing to pay the cost of being and of being here with others in their ignorance and inexperience as well as our own. We suffer because we are willing to pay the costs of living with laws of nature, which operate quite consistently whether or not we understand them or can manage them. We suffer because, like Christ in the desert, we apparently did not say we would come only if God would change all our stones to bread in time of hunger. We were willing to know hunger. Like Christ in the desert, we did not ask God to let us try falling or being bruised only on condition that he catch us before we touch ground and save us from real hurt.41 We were willing to know hurt. Like Christ, we did not agree to come only if God would make everyone bow to us and respect us, or admire us and understand us. Like Christ, we came to be ourselves, addressing and creating reality. We are finding out who we are and who we can become regardless of immediate environment or circumstances. What is the point of that? What is the point of knowing reality and being ourselves, of suffering as Dorothy’s friend Jean Kerr suffered and as many other people suffer daily? Why did this matter so much? One reason we were willing to pay the high costs of continuing to address reality and become ourselves is that God told us we can become more like himself. We can become more abundantly alive, with ultimate fulness of truth, joy, and love—fulness impossible for souls unable to take real part in creating it, souls ignorant of good or evil, pleasure or pain, souls afraid of the unknown. According to my understanding of scripture, we are not preparing now to begin in the next life to become more like God. We are not simply waiting to get started with the process. We are in it here and now. The implications of this are many, and there is time here to suggest only a few relevant to suffering. If we are to become more like God, we must experience and understand the reality of physical law. Nobody in our world or in God’s universe is manipulating mass, energy, motion, gravity, or quantum leaps so that they have no more reality than a TV movie or some imaginary adventure. For God, these matters of quantum leaps and mass and motion are real, and for us they are real. God functions according to laws that we are experiencing and trying to learn here. We have many scriptures indicating that our God is a God of law, and we are coming in contact with the same kind of laws he understands.42 Laws are real for him, and the same laws are real for us. If they were not, we would have either incomprehensible chaos or the kind of existence which Lucifer offered. Important to our experience is the reality of operations we can learn to depend upon and predict. Where would we be if gravity were inconsistent and we tried to sit down? Where would we be if gravity were working for some of us and not for others? Yet, when a child falls out of a high window, some wish gravity were not in effect at the moment, or suppose that God is using it to cause suffering, or look to him to stop it. The same thing occurs with other laws of mass and motion. We want to drive to the grocery store or across the country, but the same laws of motion and mass that take us on these trips can result in accidents that disfigure people for life or leave them helpless in bed for thirteen years unable to move. We live with natural law. Nobody is manipulating every human decision that would affect every human experience. If God did, we would have the kind of existence now that Lucifer offered permanently. For God, the agency and real existence of other souls is of prime value, value that exceeds any reason for his arbitrarily controlling all they experience and become. God does not make himself the only reality, or the only source of reality. “All truth is independent in that sphere in which God has placed it, to act for itself, as all intelligence also; otherwise there is no existence.”43 We cannot exist without agency and its results. Neither can we become like God if we think others must be deprived of their agency so that we can be ourselves. We are not coddled toddlers in playschool or Disneyland; we are not preparing to meet reality someday. We are in it here and now. Soon after I learned to read, I discovered folk tales and myths on a bottom shelf in the public library and devoured all that were there. Heroes and heroines were kind and brave, sharing bread with persons much uglier and very different from themselves; they were able to ride the wind east of the sun and west of the moon, and they met mountains and forests and giants and persons who could turn them to stone, and they would emerge always triumphant and happy. I was one of them and walked to school disguised as an ordinary Canadian girl in the early 1940s and thought myself kind and brave. I could meet those things and would, as the people in the stories did. I didn’t know then what it was really like to be turning into stone, so to speak, or what it was like trying to swim beyond my strength, but I know now. Though I would certainly share my bread with ugly old hags or anyone else who was starving, I didn’t understand compassion for someone hurting me in their own ignorance. I thought only evil persons could hurt me. The folktales were imaginary; life is real. Why would he speak to us in a way that would let us “fall backward, and be broken, and snared, and taken”? For many years the passage puzzled me. I couldn’t understand it. And yet, I think, if we are to understand God we must understand that passage. I learned much about it one day in sacrament meeting, not from anything I heard but from watching a little boy playing in the row ahead of me. He had a quiet book open to a page with colored shapes—a purple square, an orange circle, red rectangle, green triangle, and on top of these, attached with Velcro, matching shapes and colors. The boy was clearly inexperienced. He pulled off all the shapes, then stuck a purple square on a green triangle, pulled his father’s knee, and beamed up at him in utter delight because he had put a purple square on a green triangle and it stayed there. The father looked down, saw the mistake, shook his head, and turned his attention back to the speaker. The boy pulled the purple square off the green triangle, stuck it on an orange circle, pulled his father’s knee, and beamed up at him with utter joy and delight. The father looked down, saw the mistake, shook his head, and turned back to the speaker. The boy pulled off the purple square and put it on a purple square, discovered the match, pulled his father’s knee, and beamed up at him in utter delight. The father nodded and turned back to the speaker, and the boy began to experiment with the removable green triangle. Beyond the specifics of suffering, we too are being “weaned from the milk and drawn from the breasts” and are agents learning comprehensive matters, however brief, painful, or severely restricted earth experience might be. Even an infant born yesterday and dead of starvation or abuse within a week will experience physical reality, the quantum leaps, elements, motions, or processes which constitute physical existence. Even such an infant experiences something of how agents can affect each other and be affected by each other. Even such an ignorant child discovers that with God’s help one can survive pain, imbecility, anguish, or death, and transcend them. What we meet in the way of suffering is far more important than purple squares, but we too are discovering that we can learn, and that we can take help from our Father in order that we might survive. The history of the earth, the history of religion, is the history of human problems with understanding our Father in Heaven. We have the verse from Deuteronomy which says that if we seek the Lord with all our hearts, he will not forsake us.46 We have also, in the Twenty-second Psalm and in the words of Christ on the cross, “Why hast thou forsaken me?”47 Can we trust God? Is he a reliable help in times of trouble? In response to such questions, some vigorously nod their heads, some look doubtful, some vigorously shake their heads, and some go to sleep. Our perceptions are not identical. God is not making them identical. He is not the only source of our understanding of him or our relationship with him. We take part in creating the understanding and the relationship. He invites us to come to know him, not just to know about him. The way to know him better is to become more like him. He doeth not anything save it be for the benefit of the world; for he loveth the world. I know the love of God. It is one of the very few things I do know with absolute certainty. I think suffering on this earth is an indication of God’s trust, God’s love. I think it is an indication that God does not want us to be simply obedient children playing forever under his hand, but wants us able to become more like himself. In order to do that we have to know reality. We have to be real ourselves and not dependent on externals. If we are to be like God, we cannot live forever in fear that we may meet something that will scare us or that will hurt us. We have to be able, as he is able, to meet what comes of others’ agency, and of living in a lawful universe that allows creation of a habitable planet only when it allows also the difficulties that come in natural operations of such a planet. Some of the most difficult questions about suffering are why does God seem to intervene at some times but not others, and why should we pray for his protection. There are times we just have to say, “I don’t know,” and then trust God. I find this more satisfying within the context I’ve suggested than within traditional theologies; however, it is within the traditional framework that many LDS persons ask questions about suffering and God’s part in it. Whatever they may say they believe about law or human agency, when the anguish comes, many LDS believers look to Jephthah’s version of God and his power. In LDS theology, the power, goodness, and love of God as defined in traditional theologies are not the issues at question. Our being alive and meeting the suffering are evidence of his power, goodness, and love. God’s power is real. The power of faith is real—it is not that God arbitrarily awards help to a person good enough to have sufficient faith, but that the faith itself is power.54 Physical laws inherent in the universe are also real. God has repeatedly urged that we ask his help, with faith that he will do what is good. In every case, his definition of what is good is a matter of truth and law, not arbitrary whim. We may not comprehend all the specifics, or all the interactions involved, but we can understand the theological context within which the fragments occur. Knowing that we can stumble or fall, knowing that some do not have the gospel, or lack freedom or capacities—in other words, knowing our various limitations here—I find sense in LDS doctrine that our learning goes on after this life, and that when we fall, it need not be permanent. Many causes and effects of suffering are evident in our sense of who we are and what we can do about it. Because of our ignorance and inexperience, we are hampered by things we don’t understand and also by things we assume we do understand. What other persons have taught us, whatever their intentions, may hamper as much as help us. One of my prayers to my Father is that my children will be healed of my ignorance and will not bear forever the difficulties caused by things I have mistakenly done or not done as a parent. As I think of the atonement of Christ, it seems to me that if our sins are to be forgiven, the results of them must be erased. If my mistakes are to be forgiven, other persons must be healed from any effects of them. In the same way, if other persons are to be released by the atonement, then we must be healed from their mistakes. I think that is an essential part of understanding God’s gift: He did not make a plan whereby we simply prove ourselves already right or wrong. Rather, we must make sense of the fact that who we are and who we become is not wholly dependent on where we are now, and on never having made a mistake. Christ’s atonement makes it possible for us to go through the meeting of reality, the falling, the hungering, the screaming, the crawling on the floor, the being disfigured and scarred for life psychologically or physically, and still survive and transcend it. If that were not true, then our whole universe would have no meaning, and we had just as well be what Lucifer suggested, simply obedient robots. I know the goodness of God, and I also know the hurts of this life. Of the very few things I truly know, the most certain, drawn from the most vivid and inexpressible experience of my life, is this: God is love, and our becoming so is what matters. I pray we may gain courage and faith to affirm the choice we made, to remember that we are active and alive and meeting suffering here because God knew we could and because we believed we could. Let us choose well the theology with which we frame our experience. Let us trust ourselves and God, asking continually for the help which is good. Let us love each other, mourn with each other, and sacrifice fear for courage. Let us seek reality and truth, forgiving ourselves and each other, learning to help ourselves and each other as we can. Let us become more like our God, who is good. Francine R. Bennion, “A Latter-day Saint Theology of Suffering,” in A Heritage of Faith: Talks Selected from the BYU Women’s Conferences, ed. Mary E. Stovall and Carol Cornwall Madsen (Salt Lake City: Deseret Book, 1988), 53–76. Francine Russell Bennion, interview by Kate Holbrook, Apr. 21, 2015, 16, CHL. “Miss Francine Russell Engaged; Pamela Russell, Mr. Clark to Wed,” Deseret News, May 30, 1956. Francine Russell Bennion, Curriculum Vitae, Oct. 6, 2012, in editors’ possession. “Five Called to Young Women General Board,” Church News, May 28, 1977; Francine Bennion, “Encounter in Ammonihah,” Ensign 7, no. 4 (Apr. 1977): 25–29; Francine Bennion, “Stone or Bread?” Ensign 6, no. 1 (Jan. 1976): 38–42. Bennion, interview, 3, 12, 14; “Five Called to Young Women General Board,” 5. Bennion, interview, 5–6; Aileen Clyde, email to Kate Holbrook, May 14, 2015. Bennion, interview, 14; “Six Are Called to Serve on Relief Society Board,” Church News, Dec. 25, 1983. Bennion, interview, 17–18; Francine Bennion, email to Kate Holbrook, Apr. 14, 2016. Mary E. Stovall and Carol Cornwall Madsen, Preface, in A Heritage of Faith: Talks Selected from the BYU Women’s Conferences, ed. Mary E. Stovall and Carol Cornwall Madsen (Salt Lake City: Deseret Book, 1988), vii; Brigham Young University Women’s Conference, Mar. 27–28, 1986, Program, Women’s Office History, BYU. See Poverty and Hunger: Issues and Options for Food Security in Developing Countries (Washington DC: World Bank, 1986), 1. “Nor does the report describe underlying causes of the particular organization and decision-making processes at NASA. Citation in original: “See, for example, Doctrine and Covenants 93:29–30; Abraham 3:18, 26–28; Moses 4:1–4; Revelation 12:7–9; Doctrine and Covenants 29:36; and Wilford Woodruff’s record of Joseph Smith’s King Follett Discourse, available in The Words of Joseph Smith, comp. and ed. Andrew F. Ehat and Lyndon W. Cook (Salt Lake City, Utah: Bookcraft, 1981), pp. 343–348. See Doctrine and Covenants 88:42–43. Psalm 22:1; Matthew 27:46; Mark 15:34. Citation in original: “D&C 93:23–24; italics added.” See also Doctrine and Covenants 93:25.